The mayor wants to break down some of the barriers that distance power from people. Good call. The trappings of power are so aptly named. So many of the mini-controversies of Bill de Blasio's young mayoralty have been the byproducts of power's privilege: the Findlayter phone call, the motorcade blowing stop signs, the hush-hush AIPAC speech. None of these incidents deserved the ink it got (though some of the excess can be blamed on the way de Blasio handled them). But strung together the kerfuffles etch out a deeper truth, which is that the perks that come with a big job can be as much liability as luxury. 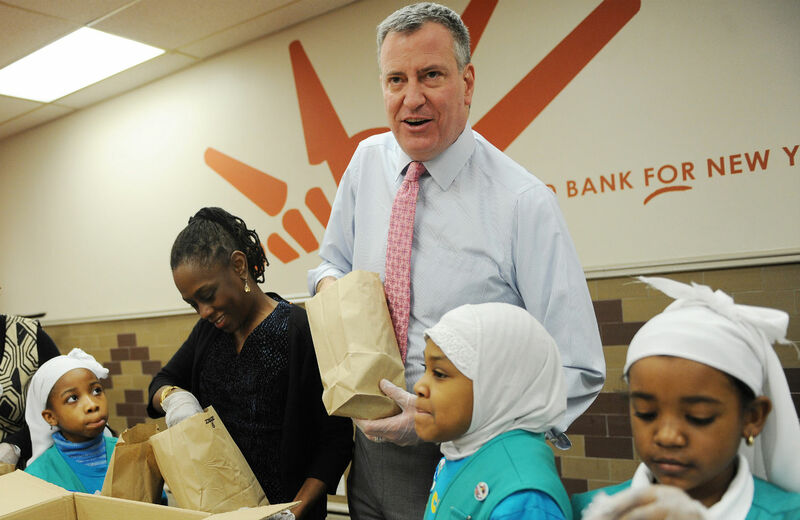 This week, with the charter and budget battles fading, the mayor is trying to turn a corner and shed some of the formality that came with the office he took three months ago. He held a roundtable with City Hall bureau chiefs, where he jocularly chided them for not wanting to meet outside and, when he did get snippy, at least prefaced it with “dude.” Bro, that's pretty relaxed! He also reportedly wants to be called “Bill” more often, and at a press conference at a Brooklyn school on Tuesday, schools Chancellor Carmen Farina did so refer to hizzoner. He's holding an off-the-record press get together at Gracie Mansion on Friday, where he and the corps will play Twister and down a few of the mayor's trademark cherry Jello-shots. OK, the last bit probably won't happen on Friday, but you do get the idea that a little less formality will suit de Blasio, who on becoming public advocate in 2009 dismissed the security team and driver that came with that office. So far, de Blasio's goofy sense of humor has been a poor fit with some of the staging that comes with his current office, like the airless Blue Room at City Hall. I write this blog clad in parochial-school style slacks and a tweed sportscoat with elbow patches that my late Dziadzia might have found a little stuffy, so I'm not suggesting that all decorum go out the window. Government is a serious thing and being mayor of a city of 8 million people requires some symbolism of authority, especially since much of the mayor's power comes not from statute but from his bully pulpit. But there's a point where the accessories of an office actually undermine its value because they make it impossible to communicate clearly with the public. For instance, there's the mayoral podium. It's a very impressive thing, wrapped in rich blue fabric and displaying on its front a large bronze city seal—the thing just sort of says “mayor.” De Blasio travels with it to events; it was there in a tiny classroom at the P.O. Suarez school in Bushwick yesterday. Bloomberg traveled with a podium, too. But according to people who remember this stuff, mayors before Mike didn't regularly do so. This might be a tradition de Blasio lets go. For one thing, because he is so tall, he's constantly toeing into place a step for shorter people whom he invites to the podium. This can look like the mayor is trying to scrape something off his shoe. For another, he doesn't need it. He's a tall guy and, especially since he shaved off de Beard, looks like a man who's in charge. He's the mayor wherever he goes and whatever he stands behind. The thinking behind this stage-management is that people won't understand or take the time to learn what a politician is doing or saying unless you spell it out for them in Crayola. A progressive vision of government has to have a little more faith in its message and its ability to communicate with people. That's why de Blasio has stressed transparency as part and parcel of his progressive agenda: Inclusion is an antidote to inequality, and stripping away some of the wax that's built up on our public offices is a way to invite people in. The mayoral podium seems a little waxy, to me… dude.